MALAPART, ANDRÉ, Parisian soldier who served under Capt. Charles Daniel of Dieppe in Acadia and published with his own additions Daniel’s report of the capture in 1629 of James Stewart, Lord Ochiltree, and the garrison of the Scottish fort at Port de la Baleine. In May 1629 Daniel had orders from Richelieu to sail with Isaac de Razilly from La Rochelle to revictual Champlain at Quebec. Razilly was ordered elsewhere, and so the fleet of the Compagnie de la Nouvelle-France set forth without him. Daniel lost touch with his companion vessels in fog and storms on the Atlantic, and on 28 August entered what is now St. Ann’s Bay, Cape Breton, alone. The French fishermen there had no news of Quebec, but told him that Lord Ochiltree, after occupying Port-Royal (now Annapolis Royal, N.S. ), had established himself on the west coast of Cape Breton in June and was exacting one-tenth of their catch from all French fishing vessels in the Gulf. According to Daniel’s account, he at once attacked the Scottish fort, which stood on a rock surrounded on two sides by water. Despite the fact that Ochiltree had armed the fort with cannon and had a garrison of 60 men, the French force of 53 sailors hastily trained in the use of arms captured the place by frontal assault under cover of bombardment from their boats. Malapart lost an eye and part of his hand in the fray. After razing the Scottish fort and using its material to build a new fort, Sainte-Anne, to guard the passage, Daniel abandoned the idea of relieving Quebec, probably because of the lateness of the season, and returned to France. On his way home he landed 42 of his prisoners at Falmouth, while the remainder, including Stewart, were imprisoned at Dieppe for a month. Daniel drew up his report of the expedition for Cardinal Richelieu at Paris 12 Dec. 1629, and it was published by Malapart the following year at Rouen under the title, La prise d’un seigneur écossais et de ses gens qui pilloient les navires pescheurs de France, par Monsieur Daniel, dedié à M. de Lauzon par le sieur Malapart, parisien, soldat dudit sieur Daniel. Malapart’s additions to Daniel’s straightforward report, which take up 13 pages to Daniel’s 6, are not notable. His intention was to supplement the omissions due to Daniel’s modesty and to the nature of a summary report. He notes that the French fishermen sent a petition to Daniel, urging him to attack the Scots. His most important observation is that some 200 French vessels now yearly visited this coast in search of cod, salmon, and whale oil, and that the whole industry gave employment to at least 100,000 men at home and abroad. He praised the company’s work, which had produced “this heroic action,” and closed with some complimentary verses addressed to Daniel. Little is known of Malapart’s later life. Various acts attest his presence at Quebec in September 1634 and at Trois-Rivières in 1635, 1639, and 1649. Malapart was commander of the fort of Trois-Rivières for some time. He is not to be confused with the Malepart who arrived in June 1636 with Huault de Montmagny. 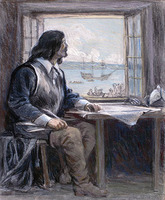 Daniel’s report was reprinted in Champlain’s Voyages of 1632 (see Champlain, Works (Biggar), VI, 157, and Œuvres (Laverdière), 1283–88), and as Voyage à la Nouvelle-France du Capitaine Charles Daniel de Dieppe, 1629, éd. J. Félix (Rouen, 1881). The English version of events in 1629 is given in PRO, CSP, Col., 1574–1660, 104–6. ASQ, Séminaire, VI, 2, 40. Biggar, Early trading companies. Philéas Gagnon, “Noms propres au Canada-Français: transformations de noms propres, établies par les signatures autographes ou par les écrits de contemporains où ils sont mentionnés,” BRH, XV (1909), 143. La Roncière, Histoire de la marine française, IV (1923), 636. P.-G. Roy, “Les familles de nos gouverneurs français,” BRH, XXVI (1920), 258; La ville de Québec, I, 143. Benjamin Sulte, “Les gouverneurs des Trois-Rivières,” BRH, II (1896), 67. Tanguay, Dictionnaire. Mason Wade, “MALAPART, ANDRÉ,” in Dictionary of Canadian Biography, vol. 1, University of Toronto/Université Laval, 2003–, accessed April 20, 2019, http://www.biographi.ca/en/bio/malapart_andre_1E.html.